On 13th October 2014 the expert on national minorities, Veronika Kristikove OSCE (Organization for Security and Cooperation in Europe), visited the EFHR HQ. 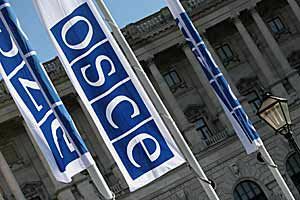 During the meeting the OSCE expert initiated a discussion regarding problems which national minorities in Lithuania have to face, like spelling of names and surnames, bilingual topographical names and the education of national minorities. An emphasis was put on a way of determination of the boundaries of the districts in Lithuania (a problem which was highlighted in the OSCE report issued in 2012) and draft legislations registered in parliament. Apart from that the representative talked about the cases looked into by EFHR, about its achievements and the problems it encounters. EFHR expressed its concern about the situation of national minorities in Lithuania which is gradually getting worse since 2010. We also noted the insufficiency of the steps taken to fill in the loopholes in the field of human rights protection embracing the rights of national minorities. The goal of the visit was to provide an update on the knowledge about the situation of national minorities in Lithuania, especially regarding the preparation stage of the law on national minorities. The awareness obtained during the meeting will help OSCE to assess and to make recommendations on Lithuania. We would like to remind you that Knut Vollebaek, OSCE High Commissioner on National Minorities who paid visits to Lithuania in 2011 and 2012, had the same motivation. During her visit the OSCE expert had a meeting with deputies from Electoral Action of Poles in Lithuania, the chair of the Commission of the Lithuanian Language. She visited the Ministry of Education and Science of the Republic of Lithuania, the Government of the Republic of Lithuania and the Seimas of the Republic of Lithuania. EFHR feels that the meeting was beneficial for both of the sides and is glad to have had the opportunity to meet an expert and to exchange observations.